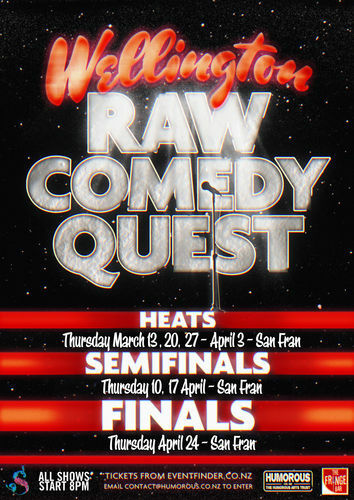 San Fran is packed and there’s a great buzz in the air – the Raw Comedy Quest final is here and almost everyone’s come to support or compete, making for a very friendly crowd. The comedians who’ve made it this far (eight finalists and two wild cards) are vying for two things: the title of Wellington Raw Comedy Quest winner 2014, and the opportunity to head to Auckland for the national final, awarded to first place and runner up. The show starts fashionably late, and yet people are still gathered at the bar (dear fellow punters, if the show starts and you’re still purchasing… shhh). MC Vaughan King is an old pro and recent arrival from Auckland, and clearly knows how to handle a crowd. Some noisy folk at the front quickly get his attention and he deals with their heckling to great comedic effect. He’s affably crass through the night, keeping things ticking along and encouraging the audience to direct their banter to him and not to the rookies. The competition opens with Alice Brine; her delightful throwaways and comfort onstage are a promising start to proceedings, despite some rough material at times. Daniel Smith earns the first spontaneous acclamation of the night with his clever wordplay – ten points to Ravenclaw for including a Classics joke! His storytelling is cohesive, competent and incredibly funny. Next up Bas Jeffrey takes the stage with good natured local banter and some interesting personal discoveries. 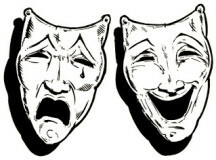 Despite some strong material and good laughs, he seems to lose confidence and moves to self-deprecation. Patch Lambert delights next with intelligent material told from a scruffy, bogan exterior. Another great storyteller. Kieran Anderson rounds out the first half with some great one liners, but somewhat foolishly engages the noisy folks from earlier and this goes a little roughly. We’re still engaged though and the audience is cheery throughout the short break. Kicking off the second half, wild card Sanjay Parbhu presents the best treatment of a rough impression of Bill Cosby I’ve seen, and some great sound effects. Despite being heckled by his dad (one of the quality surprises of the night) he maintains his composure, though his material would benefit from a more balanced delivery. James Malcolm brings us the loudest laughs including multiple outbursts of applause, and his deconstruction of Miley Cyrus lyrics has me in tears. He’s hilarious and completely fresh to the scene, what with him only being 18; expect great things from this charmer. Joel Hansby follows with low key and endearing comedy, and for some reason endures the most heckling of the night from team noisy at the front. His ‘shhh kebab’ shut down is glorious, however, and he more than holds his own. Dan Shenton follows with wonderful physicality. His slow build is a little out of place after the previous acts despite a powerful callback combo to finish. And finally, the second wildcard Alexander Sparrow finishes the night. He’s abrasive and surreal, and earns a few more awkward pauses from us in place of the expected laugh. There’s definite potential but it’s hampered by the creepy tone of some of the material. While the judges deliberate briefly outside, the guest headliner steps up. Neil Thornton is a recent import from New York, and a bold performer with intelligent material. Less gaggy, more constantly amusing and thought provoking. The judges return to wrap the night up quickly – the clever Daniel Smith takes out first place, with James Malcolm runner up. Well deserved! A few quick thank you speeches (‘Mum I’ve got your EFTPOS card, don’t leave without it’) and we’re over for another year. One of the best nights at Raw Comedy I’ve experienced; the Wellington comedy is in a great state and I’m really excited to see what the rest of the festival brings!